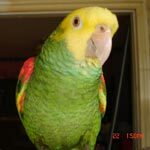 Parrot Forum • View topic - Will my flighted parrot fly into a window? Will my flighted parrot fly into a window? Re: Will my flighted parrot fly into a window? yeah, my birds only do that when they are really scared, but even when lily is panicked, she never hits stuff like that. curtains are a good idea. Windows! this is the one thing about bird proofing that i have really had to work on. Lily is flying around now, and so i got a bunch of decals for the window. they are supposed to be UV but i can tell you that they don't appear to work. i should have known - i got them from the sky mall catalog. i have been thinking about this off and on knowing that i would have to find a better solution. she hit the window once when a noise startled her. she hit it right next to one of those silly decals. not hard - she is clipped still and just experimenting with flight. you can see in the picture that the window is lined with pieces of wood that are not part of the window frame. this is where she eats her breakfast and dinner (and watches the birds). she knows the window is there but does not seem to remember that all the time. i am going to drill hooks into the wood here and there and hang some of those plastic bird chains in front of the window, that way the window will not seem like open territory, and she will have something to possibly even land on once she is able to do something like that. that is the current plan at least. My cockatiels are only loose in one room. I pull the blinds so they can't hit the windows. Myrtle learns so fast. All I had to do was walk her to a window and tap on it. Patti, as long as you have the slats on the sill and the inside sides of the window, why don't you attach some perches there? If you put, say, three of them going side to side at different heights, she should be able to land on them instead of hitting the window. Captive-bred birds would very often have bad sight (due to the practice of breeders to take them out of the dark nests before their vision has fully developed -for which they need darkness) so their distance perception is flawed and this, combined with the clipped primaries (these are the feathers that rotate so they can land, take off, bank, etc in flight) makes it real hard for birds to maneuver correctly but if you give them something they can easily see from a distance, they do much better. that's a really great idea... i hadn't thought of that. that's even easier than my original idea. i even have a drill bit wide enough to accommodate the standard perch. yay! i can't wait to go get some! thanks. liz, btw, the bird on your avatar is absolutely beautiful. is that myrtle? No the DYH Amazon is Rambo. He loves to have his picture taken. Myrtle is a BF Amazon. She rarely holds still long enough to take her picture and I don't know how to put them in the forum anyway. Wolf recently put in a picture of Myrtle trying to steal Rambo's toys. such a beautiful picture of a beautiful bird.